In the time of King Herod, after Jesus was born in Bethlehem of Judea, wise men from the East came to Jerusalem, 2 asking, “Where is the child who has been born king of the Jews? For we observed his star at its rising, and have come to pay him homage.” 3 When King Herod heard this, he was frightened, and all Jerusalem with him; 4 and calling together all the chief priests and scribes of the people, he inquired of them where the Messiah was to be born. 5 They told him, “In Bethlehem of Judea; for so it has been written by the prophet: 6 ‘And you, Bethlehem, in the land of Judah, are by no means least among the rulers of Judah; for from you shall come a ruler who is to shepherd my people Israel. 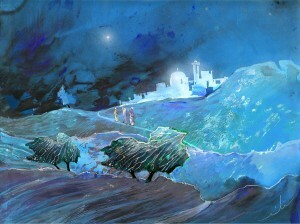 '” 7 Then Herod secretly called for the wise men and learned from them the exact time when the star had appeared. 8 Then he sent them to Bethlehem, saying, “Go and search diligently for the child; and when you have found him, bring me word so that I may also go and pay him homage.” 9 When they had heard the king, they set out; and there, ahead of them, went the star that they had seen at its rising, until it stopped over the place where the child was. 10 When they saw that the star had stopped, they were overwhelmed with joy. 11 On entering the house, they saw the child with Mary his mother; and they knelt down and paid him homage. Then, opening their treasure chests, they offered him gifts of gold, frankincense, and myrrh. 12 And having been warned in a dream not to return to Herod, they left for their own country by another road. The wise men see a star and they take off for the West. The conversation between them is interesting to imagine. Did they spend a lot of time wondering where they were headed? Or if they were going the best way? The right way? My husband and I often go back and forth about the quickest or most efficient way to get somewhere and I wonder if the wise men’s conversations sound anything like ours. Examining roads ahead and questioning people who have gone that way about the road, safe rest stops or good places to eat. Maybe there is a little frustration at the pace of things or with each other. Perhaps they even wonder if they’re there yet or if they’ve taken a wrong step along the way. For the wise men, Jesus as the epiphany means a manger scene. For us now, today, Jesus as the epiphany means a few different things about how God is revealed in Jesus the Christ. In the bread and wine of communion, Christ enters into us bringing forgiveness and life. In the waters of baptism, the Holy Spirit plunges us into Christ’s death and raises us into Christ’s life in the community of God’s whole church, the church catholic. One of the things that being church means is that the Epiphany of God in Jesus means being on another road, moving through the world differently than a wider culture. I’m under no illusions that this has always been a good thing. After all, this has brought us the Crusades and a myriad of other self-righteous acts wrought in the name of God. But it also brought 17th century English Christians as the primary caregivers of those with the Plague and brings Christians today who fight against malaria all over the world so that people may live. The mixed outcomes of the church globally are mirrored in local churches, mirrored here in our congregation today. We have hits and we have misses as we respond to the Epiphany of God in Jesus in this place and time. But there is one way in particular that the Holy Spirit, through the neighborhood church, moves us out another road. And that is the way we agree and disagree with each other here in this place and also between churches. Because the church is a public place and we are unable to indulge in creating our very own echo chamber of unilateral agreement. United by the Holy Spirit as one in Christ means that many voices come together all at once in the space of the church that wouldn’t ordinarily mixed together outside of church. It is good that we challenge each other about what keeping our eyes on Jesus as the star in our lives means so that our actions, like the wise men’s, pay him homage. It is good that we do this is big ways in our church communities and it is good that this gets lived out in personal ways too. Coming up on 16 years ago, Rob and I were drawn into this congregation when we brought Quinn here to be baptized and then Taryn too not very many months later. Hearing the Gospel through Pastor Rob that we are saved by grace through faith, not through who we are or what we do, was and still is like breathing pure air. And being with you all over time in various potlucks, Bible Studies and committee meetings has also revealed the Gospel truth that we are fully saints…and fully sinners…and loved by God and by each other. Nearly 10 years ago, I preached my first sermon here – you indulged my fumbles, encouraged my enthusiasm and began saying things like, “Have you ever thought about seminary?” Truthfully, I thought you were crazy. At the time, Quinn and Taryn were three and five-years-old and I felt like such a freshie in the saved-by-grace-through-faith thing. But I also knew that you all were affirming something that I felt deep inside – that I was supposed to be talking about this wild thing called the Gospel and this grace-filled God of light who puts us on another road. Eight years ago, probably almost to the day, I turned to my husband, Rob, and said, “I think I’m supposed to be a pastor.” His immediate reply? “Of course you are.” I quit my job as a nurse a few weeks after that conversation with him and my family and I hopped over to this other road with your constant encouragement as fuel for the journey. I am eternally grateful for you. This is but one preacher’s tale out of Lutheran Church of the Master. The Holy Spirit, working through you, has sent several of us out by way of another road – Michael Tekrony and Gail Mundt, to name a few more recently. But birthing preachers is not all that happens by the power of the Holy Spirit through this congregation. Think of all the kids who have grown up here with your constant focus on how we might better serve them and their families as well as kids and families in the Green Mountain neighborhood and around the world – calling passionate shepherds among us like Jason, Brandi, BK and Pastor Brigette. Think of everyone who gives and receives care through this worshiping community during times of births, life celebrations, poverty, imprisonment, illnesses and deaths. Do you do this perfectly? No. Do you do this faithfully? Yes. The scope of God’s mercy and power made real through you simply boggles the mind. The Epiphany of God in Jesus, revealed here through you by the power of the Holy Spirit is a wonder to behold and a wonder to experience.